Flex Technologies and its predecessor companies have been active in the biomass and related markets since 2005. 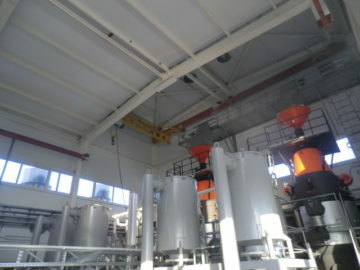 We have completed several biomass gasification power and CHP plants. Based on the experience gained from these projects we are offering proven gasification technology, complete plants and separate equipment for biomass gasification, syngas power generation, gasification condensate treatment, fuel preparation, gasification char briquetting for your new projects. Click here to see a video of this power CHP plant. 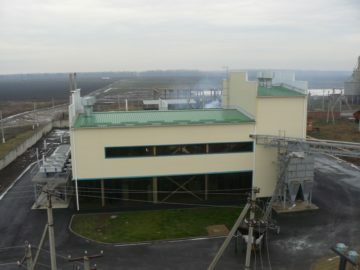 Biomass fuel used in this CHP plant is sunflower husk produced in a sunflower oil mill located in the Krasnodar region in Russia. Sunflower husk feed volume is 17 ton/day (sufficient to maintain 700 kWe capacity when operating on high density round sunflower husk briquettes produced on site with a briquetting plant supplied by the owner). This CHP plant was commissioned in 2013 and has allowed the owner to substitute up to 100% of electricity formerly supplied from the grid with internal power generated from waste. The costs for disposing of waste sunflower husk have been eliminated. 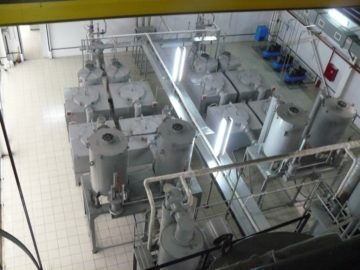 2 x WBG-500 sunflower husk gasifier systems with a standard wet gas cooling and cleaning systems, running one by one or in parallel, and feeding syngas to a common header box from which it is distributed to three syngas engine gensets. 2 x Skid-mounted waste water treatment systems which currently are not operating thanks to the new advanced cyclones installed by the owner. 3 x Cummins GTA-1710G 250KWe syngas engine gensets, running one by one or in parallel when synchronized with the local grid. 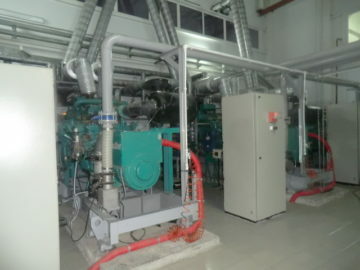 3 x 270KWth heat recovery systems which recover heat from engine jacket cooling only (engine exhaust is reserved for further heat recovery steam generator to produce process steam for the oil mill). 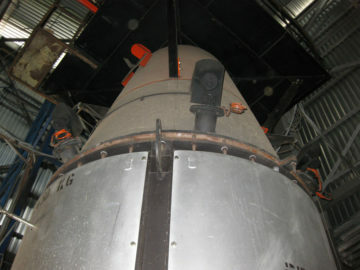 1 x Gasification char briquetting plant supplied later by the owner. Engine gensets are synchronised with the grid and the entire power output is supplied to the sunflower oil mill. 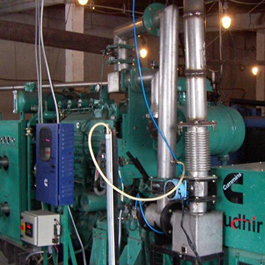 Hot water from engine jacket heat recovery is used to supply process heat and meet general heating needs of the mill. Click here to download a detailed case study report for this project. This low cost mini biomass gasification power plant is designed to utilise small dry wood block (off-cuts originating at a woodworking mill) in Uzhgorod district of Ukraine to supply power for the mill requirements. Such local supply can be a very cost effective solution for operators in grid constrained areas, as well as allowing exports of surplus energy to the grid if add grid synchronization and generator protection panels. 1 x WBG-500 wood gasifier system with a standard wet gas cooling and cleaning system which feeds syngas to a header box from which it is distributed to two syngas engine gensets. 2 x Cummins GTA-1150G 160 kWe syngas engine gensets, running each on independent load. Flex Technologies completed commissioning of the plant and handed it over to the customer in 2011.